What is the fashion psychology of wearing dresses? I took this picture above at least two or three years back. I was focusing my attention on the woman on the left. I loved the way she was wearing a heavyish boot with a sleeveless dress; the juxtaposition of feminine and masculine. 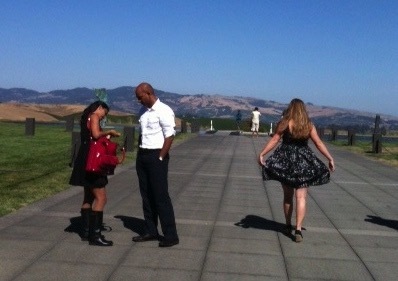 And who doesn’t love that she brought a bright, shiny red bag with her that day to Artesa Winery near Napa. I came across this photo when I was in my files looking for something else. This time, it was the woman on the right that held my attention. She’s playing with her dress, in a world of her own. I want to feel the way she looks. I struggle to find words to describe the feelings this image evokes in me. I need your help! Is it the joy of being a woman? Is it the sensuality of wearing a dress on a hot day? Whatever it is, when I look at this picture, I want what she’s evoking. 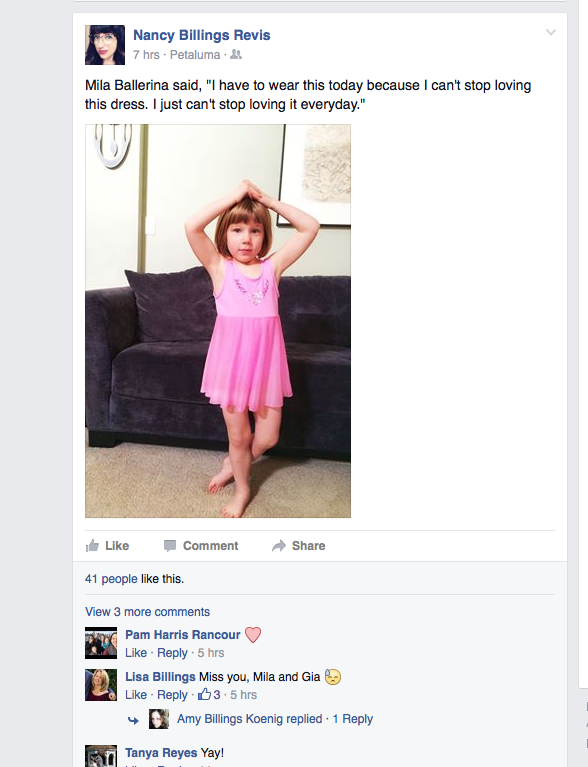 And here’s another girl who is over the moon about wearing dresses. 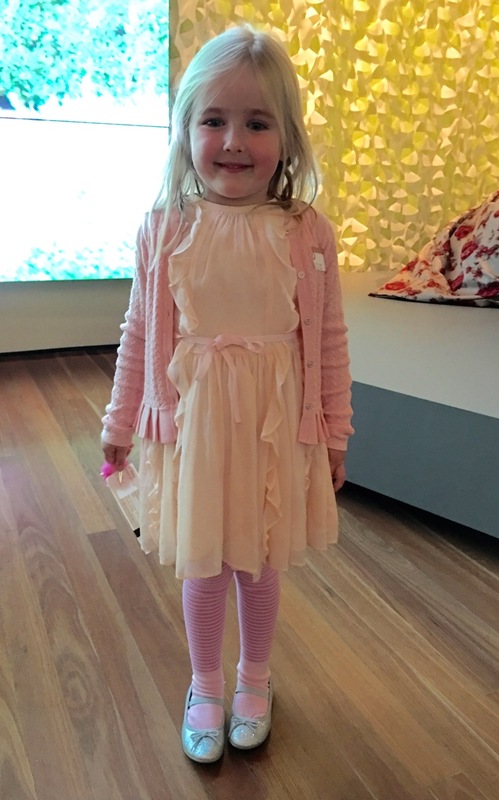 She’s telling her mommy, “I have to wear this today because I can’t stop loving this dress. I just can’t stop loving it everyday.” Oh to feel that way about a dress! And my last dress mentor, below, is Hailee. I met her at the Oscar de la Renta fashion exhibit at the end of March at the de Young Museum in San Francisco. She wore this dress that day because she was going with her mom to see lots more pretty dresses. Does she look absolutely delighted with her choice? Yes! I think this is true for many of us: when we wear a dress it’s with much more intention than jeans or ankle pants. It’s festive, fun; maybe we’re attending an event. Stay with me, I still need your help. Do you feel different in a dress than pants? What is that feeling? I was invited to a Saturday night gala at the Ritz-Carlton in San Francisco. 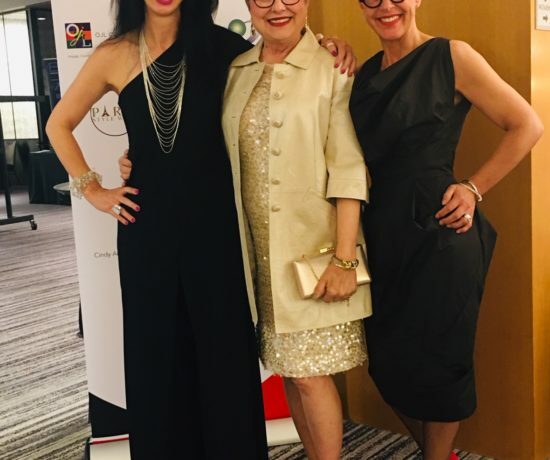 I thought of wearing tuxedo pants or lace pants but then I thought about my dress mentors, Caitlin (my daughter in the first photo, the one on the right), Mila (my friend Nancy’s daughter in the Facebook post), and Hailee from the Oscar exhibit. I’ll give you the breakdown and the details in an Anatomy of an Outfit, but here’s a sneak peek at what I wore to the gala. 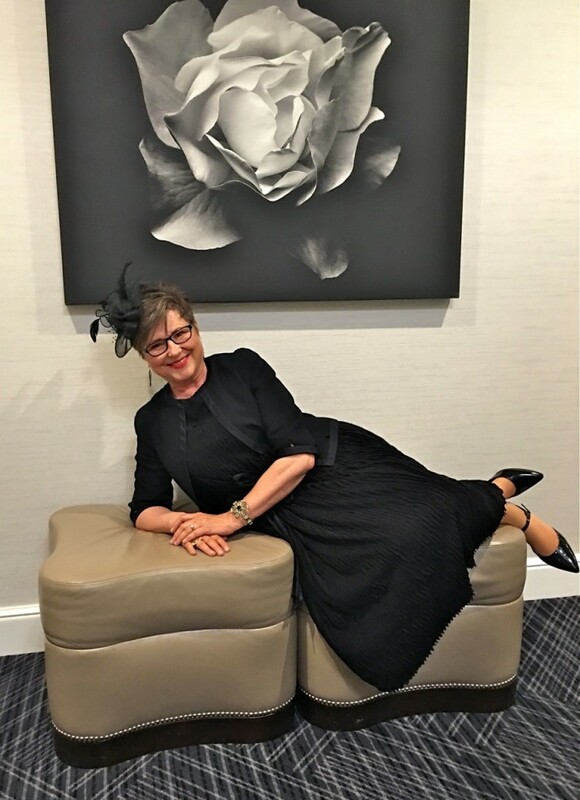 In the meantime, please leave a comment and help me figure out how wearing a dress makes us feel differently in a world full of way-too-casual wear. I need to figure this out! Help me please! Love this, Brenda! I hope this feeling carries over to the trip I’m going on — just packed 7 dresses and only two outfits with pants! Amy, can’t wait to hear about your adventures. I must say you are rocking the look of dresses. Your recent post on jewelryfashiontips.com about caftans has me contemplating one for sure. Where do you find yours? Have fun in Vegas, Baby!!! Yes, to dresses and skirts! I always pack dresses and skirts when visiting Mediterranean countries. I feel so feminine, my legs look longer, I can stride when I walk, and best of all, appreciative looks!! Thanks, Brenda, for helping me realize I don’t have hips but I can still swish my skirt when I walk. Ha, this has been fun. Ah, swishing! Swishing is such a cool thing! For some reason I am thinking of being a kid and flying through the air in a swing on the school playground, loving the feeling of air rushing past me. Kind of like swishing! I love the longer legs part too, oh, and the appreciative looks! A dress wins over yoga pants, hands down. Hoping this summer to see less yoga pants on city streets and more swishing of skirts or dresses. Thanks for sharing, Pat! Last September I spent two weeks in Edinburgh and London. I’ve been before and know that people in European cities tend to dress up more than we do here in the states. (I live in rural southern Virginia where there isn’t a lot of reason to dress up.). I wore a dress or skirt with boots almost every day and felt so good. It made me feel less of a tourist and as if I fit in wherever we went. The plan was to continue once we returned home. Sorry to report that that didn’t happen. I love the feel of a swishy skirt or dress…it does make me want to twirl. I feel free, more polished, lady-like, girly – even in a super casual dress from an outdoor store! Now if I could just make myself put them on regularly, maybe I could start a trend in Southside Virginia! Oh Jill, this sounds delicious. I am a big supporter of you starting that trend! Love your words: free, more polished, lady-like, girly. As women, I think we carry a lot of weight on our shoulders, busy taking care of friends and family. Your description is the opposite of weight on one’s shoulders. LOVE it! I’m in my pjs right now but getting dressed in 30 minutes. I think I must wear a dress!! For me, it’s the simplicity of the one-piece construction. I can play with accessories, but I don’t have to try to figure out if the top goes with the bottom, etc. And skirts and dresses are much more comfortable than pants. I’m on the hunt for one or two more for summer. Funny, I’ve often said the same thing to clients: wear a dress and you don’t have to think. It’s something worth remembering. 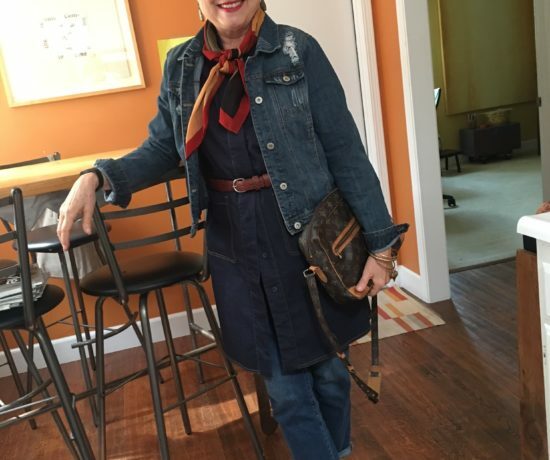 Last summer I wore dresses over cropped cotton narrow pants a lot–kind of an Indian flavor. I didn’t wear jeans for two whole months. Just accessories and the dress to think about. Hope your hunt for dresses is successful, Beverly! 4) In summertime, nothing beats the simplicity of wearing a dress + sandals! I have dozens of dresses and wear them all! You do indeed have the perfect figure for dresses!! How very fun for you. I have a little bit of envy over here because with my body shape it’s tougher to find dresses to fit well. Thanks for sharing your success and inspiration! Sounds like this is the year to stock up on the high waist pants! I have someone else who have proportions like you and she is so thrilled to see this option again. Good luck with the hiking pants. Isn’t it fascinating how bodies are all different? 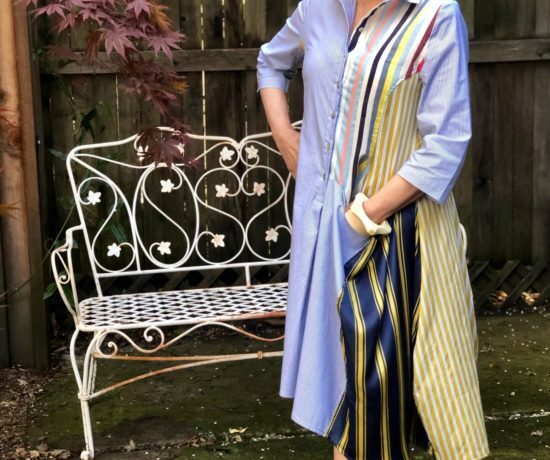 In one of my IG posts I am wearing a navy blue tea length dress made of linen. I felt like twirling when I put it on! It’s fun to dress ‘girly’! In the scheme of things I know that clothing isn’t that critical compared to survival, etc. However, I think clothing does have the ability to change our moods, give us confidence and present a sort of ‘armor’ to the world. Feeling good in one’s clothing is mentally strengthening. I am old-fashioned in that I feel most people dress too casually. I’ve seen university teachers show up to work looking like they had planned to do yard work or go to the park! Not my cup of tea. I think clothing also is a statement of respect for oneself and others… a sort of graciousness. Oh my gosh, I so agree with you! Clothing is a statement of respect for oneself and others…YES! Clothing has the ability to change our moods…yes, dramatically! 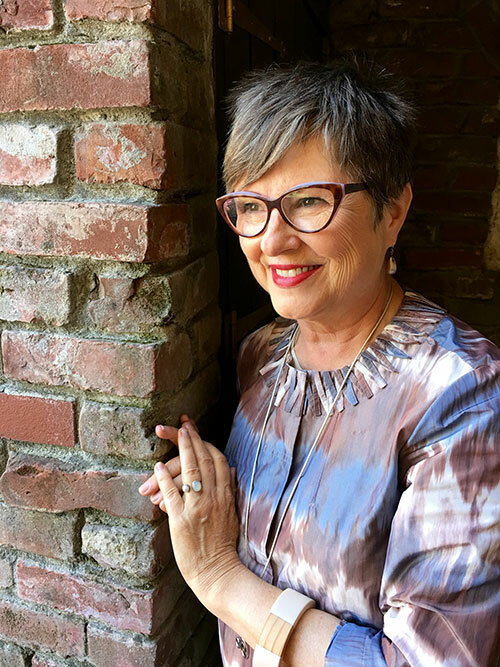 Clothing can give us confidence…yes, indeed. 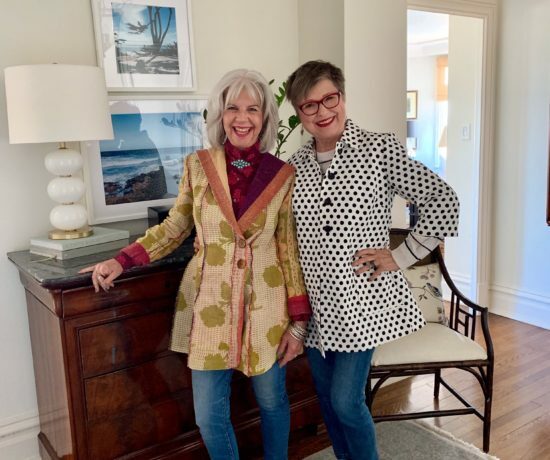 Clothing presents an armor to the world…absolutely and actually, in many cases that ‘armor’ for me is about saying, “This is me! This is me on purpose and I’m ready to interact with you now!” I think it is a dangerous thing (and not dark alley dangerous of course) to misrepresent yourself. People make impressions all the time and why not serve up your choice of what you want to say to the world through your clothing. You bring up great, great points. Thank you for sharing!